Unexpected tears slid down my face as I walked to the community polling location this morning. A woman was actually on the ballot as the presidential nominee from a major party. Men and women took her seriously enough to put their trust in her to be the president of the United States of America. Honestly, when I was my students’ age, I didn’t think this would happen in my lifetime. But it happened today. And I voted. Your protagonist gets a scar. This is a ten minute sprint. Go! Writing sprints are the NaNoWriMo way to race through a scene, change things up in your novel, or just pound out some more words. To join the sprints, follow the hashtag @NaNoWordSprints on Twitter or check the NaNoWriMo YouTube channel. The YouTube vlogs use the term Write Ins in print but you’ll hear “word sprints” in their words. Be prepared to be energized! Check out the first Write In for 2016 right here. 5 things need to be in place for a successful NaNoWriMo rollout in class. for a challenge.” “Anyone heard of NaNoWriMo?” Be vague. Don’t respond to their follow up questions inquiring why you want to know. Let the students wonder and anticipate the next bit of information you let slip out. Students need a lot of story to tell. Loads and loads of words and sentences need to be ready to roll off their fingers right on November 1. Your role is to get them thinking, planning, mentally revising so much that when November 1 comes around the floodgates are unleashed! The Young Writers Program NaNoWriMo site has digital workbooks that are thorough to the point that the classroom teacher would have to set aside about three weeks of curriculum time to use all of the resources. Not having the luxury of that much time I pick and choose. This year my students wrote their ideas in PowerPoint in Office 365 so that those resources would be in the same OneDrive folder as their writing. Set writing goals. The students are practicing writing for extended periods of time. The NaNoWriMo part is just a bonus. View this as a Couch to 5K race. Create a calendar with the number of minutes students are to write in class each day. Silent Sustained Writing is the plan. Post the calendars around your room and in any online tool you use with your class. My calendars are in Schoology, the front of the room and along the side wall. You want the students to notice this everywhere. Prizes! We love motivation and prizes! Remember there are some things only you can give them. I give students writing a novel the daily 10 minutes dedicated to typing skills. Specific word goals are also used with even better prizes. The buttons from the YWP are coveted. Inspiration from other authors. Search NaNoWriMo on YouTube to discover a whole world of excitement you didn’t even know exists. People are passionate about this writing challenge. Passionate! And they vlog about it. That energy is infectious. Bring it into your classroom and see who it touches. “Are we doing NaNoWriMo again this year?” asked the returning student. Honestly, it surprised me. A student looked forward to the NaNoWriMo challenge? I was more than a bit impressed. Last year I learned about NaNoWriMo while watching a Ted talk. The topic was that we have the ability to learn anything. The speaker listed the things he had tried in the past year and one of them was this challenge. It turns out that thousands of people attempt to write a 50,000 word novel in the month of November. Now it has a name, National Novel Writing Month. The student version was what I implemented in class with more success than I anticipated going into it. “Are you doing NaNoWriMo, Mrs. Colbert?” Honestly, I don’t think I have a novel in me. On the other hand, I learned about National Blog Posting Month, NaBloPoMo, and have this well intentioned, but ignored blog available. Consider me in the game to write and publish one post every day for the month of November. TEAM class students, the one class with a three year academic and emotional bond. Last year’s yearbook editor who had a vision for including some type of group photos that combined an academic and emotional focus. The year’s yearbook staff who decided not to do TEAM pictures, saw a need for group pictures, then came to the idea of continuing with those group photos but to provide more structure to the arrangement of students. Yearbook and leadership students using the guess and check method to figure out an optimal arrangement that would work for every TEAM class and marked it with blue tape on the amphitheater steps. The ASB Spirit Commissioner who thought she had mastered the art of looking away to avoid being called on and included in class discussions. That changed when she joined our class. 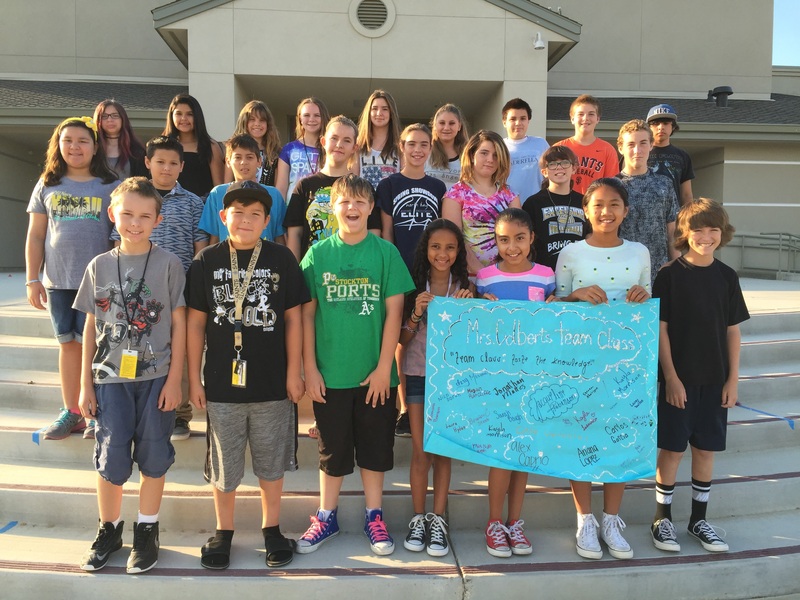 The student who makes thoughtful cards for classmates to brighten up bad days. A game these students created to make weekly progress reports fun. Heartache, celebrations, frustration, unleashed potential. The lesson taught by students resulting in the poster they are holding. How much we’ll miss each other when the 8th graders move on to high school. Getting started with Kahoot! is as easy as a few clicks. Visual learners, this video will walk you through the sign in and quiz creation process. To try my Google Apps icons game, click here. Let the students figure out how to play on their own. Figuring it out is a quick lesson in learning. Establish guidelines for students to use when entering their nicknames that will appear on screen. In my class, students must use their first name and any symbol or emoji they choose, but cannot add any other words. This allows for creativity and keeps down the smack talk. Posted on August 30, 2015 Categories UncategorizedTags education, Kahoot, middle school, quiz, technologyLeave a comment on Does Your Class Kahoot? Setting the bar high at the start of the school year is such a no brainer and yet a formidable challenge. Take Leadership’s Spirit Committee for example. In setting goals for the year, the commissioner made the observation that she’d like to see more days where everyone just wore their school shirts. Way back about 6 or 7 years ago, we always wore school shirts on Fridays. I don’t remember it being advertised, it was just a thing. In these students’ lives, 6 years ago was all about the excitement of Frog and Toad. So, they are starting it up again. 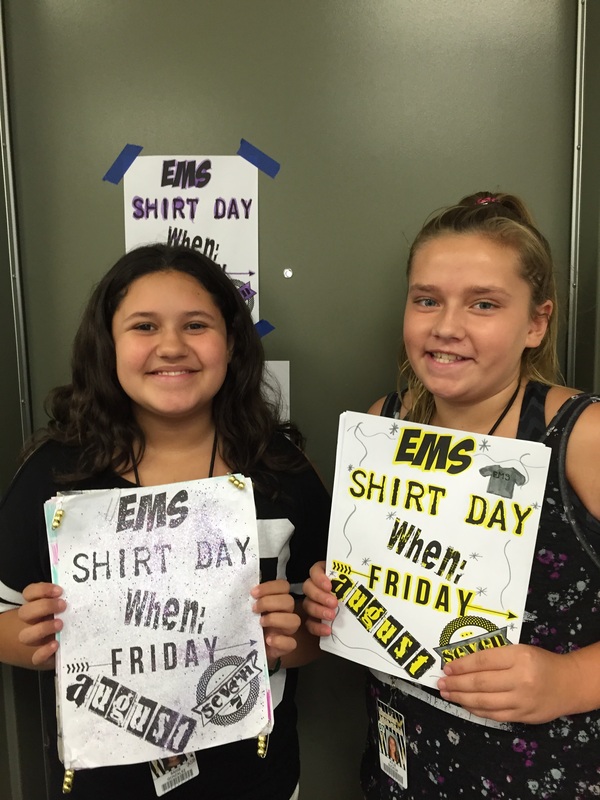 Spirit committee members took home copied fliers and decorated them to hang up at school. The thing that popped out to me is that they clearly care. Look closely at the sign in the right, she added gold cirly cues to brighten up the sign! 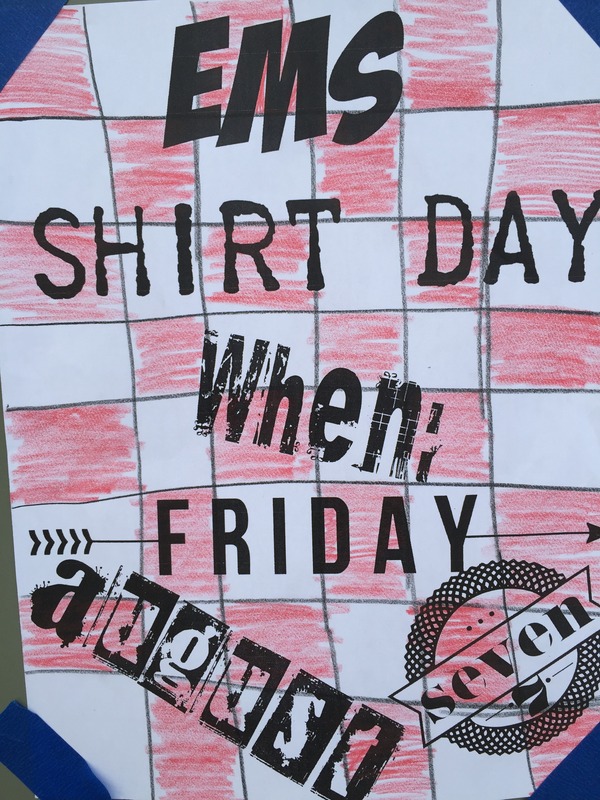 Now let’s keep working so the students can revive the school shirt on Friday’s tradition. Enjoying the trip of a lifetime! Photography tutorials and tips, photo ideas and travel diaries. Applying a lens of technology, reform, and social justice to K-12 schools.